תמיכת ראש בצורת צווארון למניה נפילת ראש לצדדים, מגיע בגדלים שונים, ניתן להוסיף מתגים ואו תמיכות צד נוספות, קיים בולם למשתמש ספסטי, ניתן להרכבה על גב קשיח בלבד. Head and neck positioning is one of the most difficult challenges we face. The i2i System was developed by Leslie Fitzsimmons PT, STP who after trying all available options decided that enough was enough and designed the i2i System for the most challenging students at Lakeview School in New Jersey. 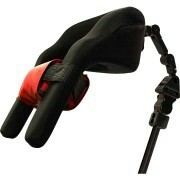 The unique integrated form (shape) of the i2i connects the head, neck and shoulders and forms a support similar to that of an exoskeleton. Unlike many collar type devices, the i2i does not position low on the neck which tends to leave the upper neck and head unsupported. The anterior arms of the i2i act as an anchor for the Chin Prompt, provides an anterior thoracic boundary and creates a channel to direct extensor tone into a mid-line position. The lateral component promotes mid-line head position and offers cervical support while maintaining range of motion (ROM). As a client begins to extend, their head is invited back into a more neutral position. A mid-line position discourages reflex postures and provides appropriate proprioceptive input. It has also been found to promote the development of controlled neck flexion and extension.